So, you are a new flatbed trucker in the process of getting your rig together so you can start searching for loads. You’ve heard other truckers tell you to purchase several tool boxes to carry all your cargo control supplies. That is good advice. You will probably need at least two boxes, if not more. You’re going to need the space to store all your tarps along with your winches, straps, chains, etc. It might take some time for you to figure out a tool box configuration that works for you. To help you make wise purchase decisions, we have put together a list of things to think about as you are shopping. Don’t hesitate to ask other truckers for their advice as well. You can learn a lot from veteran flatbed truck drivers. The first thing to consider is where you plan to position your trailer tool boxes. Why is this important? Because tool boxes have doors that can get in your way if you don’t place them correctly. For example, consider a tool box that you plan to mount underneath the trailer bed for tarp storage. You have to look at how the door of that box will operate. Some tool boxes offer doors that open from the top down, protruding outward in the open position. This kind of arrangement might be suitable for a box mounted near the front of your trailer where you are not likely to need a lot of access. But the door could get in the way if that same box is mounted toward the rear of the trailer. A better option might be a tool box with a door that opens from the front and hangs below the box. You will require larger boxes to store truck tarps while smaller boxes are suitable for straps, winches, and hand tools. The reality is you might not know what your space requirements are until you have been on the road for a while. So we recommend at least one large box to handle your tarps along with another small box for straps and winches should be fine. You can add additional space in the future if you need to. 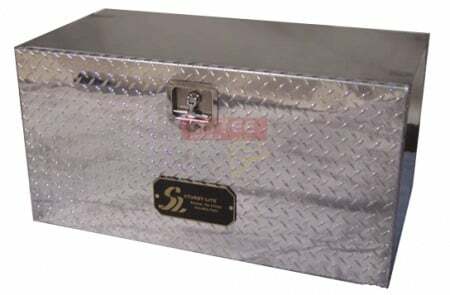 Most flatbed tool boxes these days are made with high-grade aluminum (with steel doors). This sort of configuration gives adequate strength without adding unnecessary weight. Having said that, you can buy some pretty hefty tool boxes that are rather heavy. Just remember that every pound added to your rig has an effect on fuel mileage. The idea is to use as few tool boxes as necessary and to purchase boxes that are as lightweight as possible without compromising strength. As with anything else, the reputation of a given brand says a lot about what you’re paying for. Brand-name products tend to be more reliable than their generic counterparts, hence the fact that they cost more. A higher price tag is certainly warranted when it comes to flatbed tool boxes. Lastly, you’re going to need mounting brackets to properly secure your tool boxes. Make sure the brackets you choose are compatible with your boxes, or you could find yourself having to rig something up. Should you purchase from Mytee Products – and we hope you will – we have mounting brackets suitable for all the tool boxes we sell. Tool boxes serve as critical storage space for flatbed truckers. As a new trucker, you are going to find that your tool box needs change over time. Rest assured, Mytee has everything you need for effective cargo control. When the government enacted the Compliance Safety Accountability (CSA) initiative in 2010, they did so as a means of replacing outdated regulations with new rules designed to make trucking safer for drivers, fleets, and shippers and receivers. One of the inevitable results of CSA was more scrutiny of flatbed drivers who now have even greater responsibility for making sure cargo is safely secured.